There is a price war on in the Rs. 20,000- 25,000 Crore LED market in between the top three brands LG, Samsung and Sony. The Market leaders are implementing a 15 % cost cut as they are facing intense competition from the smaller player. The TV Brands who are smaller player in the market are selling their products at an average Rs.5000- Rs. 8000 Cheaper than the main brands. Consumer too are showing a tendency to buy these products which has an offline and Online Buying model .It is surprising to note that globally there is no decrease in the Price Range. 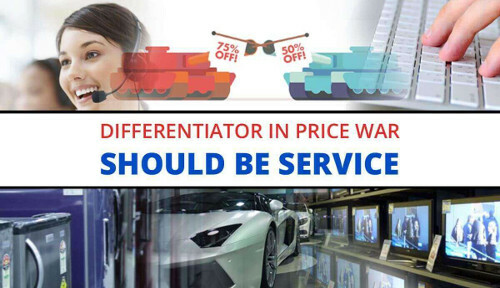 However in this price war, the vendor who will sustain in Long run should not be only Price Differentiator but also Post Sales Service Differentiator. A leading Bengal Player in LED Business has set up a mile stone in this. This company has aggressively tapped the Bengal Suburb demand and the differentiator in the business is the gamut of Software used by the company to have a better Post Sales Service. A leading TV maker of West Bengals Panorama was one of major success stories of 90’s and have their operations for around twenty three (23 years) now. Their monthly Sales of 35,000 and 40,000 TV sets cater to 10 % of Rural West Bengal television Sale in LED Segments. In 2015, the company faced challenges and Operational losses due to Post Sales Services not addressed properly. The following reasons were attributed to the challenges faced by the company. Inefficiency in the Sales team due to poor Distributor and end customer visits. Poor tracking of On Field Sales Team. Wrong Bill Submissions affecting companies budgets. Service Centre Management Solution – This is a solution deployed for the Service Center to manage the service requests. The Service Engineers and the Service Centre can update in real time the service status which can be viewed by their end customer. This provides streamline Service to the customers. The Service Head uses an app to get a bird’s eye view on the status of the service and to handle any escalations more efficiently. It also helps the Stores to track the movement of the Spare parts and their installations. On-Field Sales Tracking – Android App and Web Portal deployed in 2016. The Android App is being used by the On-Field Sales Force Team. This app works on GPS technology and tracks the Location of the user during Work hours. The User has the ability to Check-In and Check-Out their visits at Dealer/ Distributor/ client place at real time. They can record the Sales value, Payment collected, conveyance and other summary of the discussion of a particular meeting. In the back office/ App, the reports are available at real time for the Sales Head and other Departments. The App based on the visits also helps tracking the Attendance of the Field Force.